We once had big dreams for the city’s newest park. Let’s not abandon them. Recently, I took a walk along the Rose Fitzgerald Kennedy Greenway. I enjoyed strolling through the urban gardens and considering the terrific new public art. It was hot, and kids were playing in a fountain near Faneuil Hall and holding tight to seals and falcons on the spinning carousel. It was a pleasant experience, and yet the Greenway still feels incomplete. The problem isn’t what’s there but what isn’t: compelling reasons for most Bostonians to make the Greenway an essential part of our lives and for tourists to make it a must-see part of their visits. The Greenway, for all its charms, does not yet provoke the praise that rains down on public spaces like New York’s High Line, Chicago’s Millennium Park, or Houston’s Discovery Green. Are these comparisons fair? No. But fair is not the point, fulfilling a crucial promise is. Years ago, Bostonians from every walk of life invested countless hours crafting the original Greenway vision: a public space so enticing that it would serve as Boston’s common ground — expanding a financial and tourism district into the true heart of a diverse city. Today, as disparities between rich and poor surpass levels last seen in the 1920s and we still struggle with racial and cultural conflicts, we need this vision more than ever. Boldness marked the birth of the Greenway idea. The city made headlines when it told the federal government we wanted to build an urban garden of delights — complete with buildings that celebrated Boston’s history, art, and culture — atop the buried Central Artery. But that’s not what we got. We spent roughly $14 billion on the Big Dig’s tunnels, but in 2000, as they were nearing completion, only about $65 million was earmarked for surface treatments. Then various agencies began to argue over funding and the Great Recession hit, swamping fund-raising for proposals like a $70 million Garden Under Glass at Dewey Square and a $120 million Boston history museum at Haymarket. The stage was set for an underwhelming Greenway. That the park has come so far since is a testament to the Greenway Conservancy, which has worked tirelessly to maintain and improve the space, and with remarkably little support from the rest of us. It brought food trucks, fountains, a carousel, hundreds of free events per year, and a public art program that’s growing — last month alone saw the announcement of more than $1.25 million in new funding for it. The Conservancy’s efforts pushed visits past 620,000 in 2012, up from an anemic 96,000 in 2009. Even now, however, the Greenway is still in its formative years. So what should we do next? 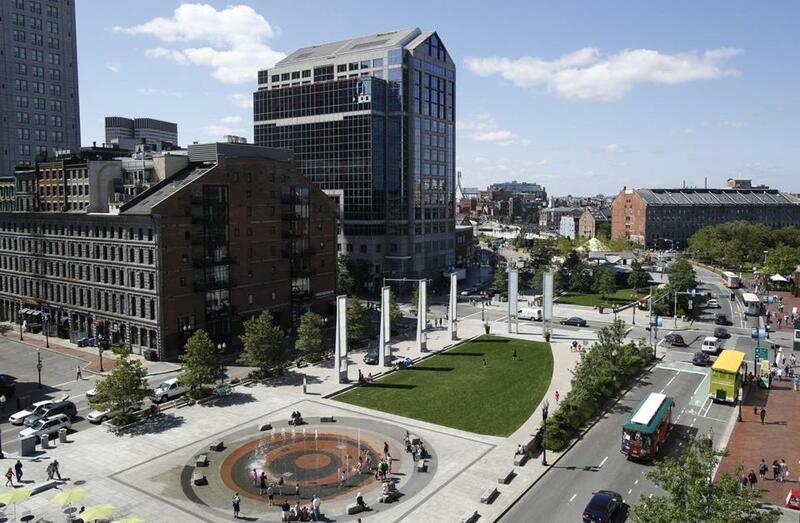 The Greenway has generated more than $3 billion in commercial real estate value along its length, according to a 2010 report to the city, and developer Don Chiofaro recently revealed plans for a $1 billion pair of 600-foot mixed-use towers nearby. But the Conservancy still struggles with private fund-raising and the fear of losing state money, which accounts for some 40 percent of its budget. The Conservancy has discussed forming a Business Improvement District, which would tap abutters for fees, and we should pursue that idea. Such a district is what revived New York’s Bryant Park. The Greenway’s potential captured the imagination of innovative designers around the globe. One suggested a continuous urban park that dipped under bridges carrying the cross streets that now cut up the space. A number emphasized making the Greenway interactive for kids of all ages, including play fountains that would become places to celebrate a winter city with ice skating, and saltwater wading pools filled with coastal sea life. One loss is particularly egregious: a proposal for a 21st-century YMCA that would have given every kid in Boston a reason to be part of downtown. What would better symbolize the Greenway’s spirit as a gathering place for all? Houston and Wichita have created state-of-the-art downtown Y’s — why can’t we? Playful public art turns crowds of strangers into instant communities as they gaze into Anish Kapoor’s Cloud Gate sculpture in Chicago’s Millennium Park. Architect Christopher Janney’s movable Sonic Forest has the same effect as visitors transform public spaces with light and sound. (As luck would have it, Sonic Forest will be installed on City Hall Plaza during the August 15-17 GreenFest.) Homey community potlucks hosted on Birmingham, Alabama’s Railroad Park bring people together across lines of age, race, and income. Environmental problems can inspire ideas like the fantastical metal Supertrees that generate power, purify air, and cool visitors in Singapore’s Gardens by the Bay. Or we could tap our own design, hacker, and maker communities to build revolving programs around enriching public spaces, like the Boston Design Museum’s Street Seats competition that brought thousands of visitors to Fort Point in 2013. Make the Greenway about more than play. Genuine common ground is also about civic discourse. The governmental reactions to the Occupy encampments that spread across the United States in 2011 revealed a sad truth: No city really knows how to handle the tough public conversations made necessary by growing economic inequality. Borrowing from London’s Hyde Park, part of the Greenway could become Boston’s own Speakers’ Corner. This could become our most profound message for America’s other great urban parks. We once had big dreams for the Greenway, and we shouldn’t give up on them. We are one of the world’s wealthiest cities. New leadership has taken over City Hall and will soon enter the State House. We are a city that cares about our people and our future. David Dixon leads Stantec’s North American Urban Group and is the coauthor, with Lance J. Brown, of Urban Design for an Urban Century: Shaping More Livable, Equitable, and Resilient Cities. Send comments to magazine@globe.com.